Mush’s first book, Dhinchak Life, was published in April 2012 and is available through Amazon, Author House, Barnes & Noble and over 20 other online retail stores. A Kindle version is also available on Amazon. 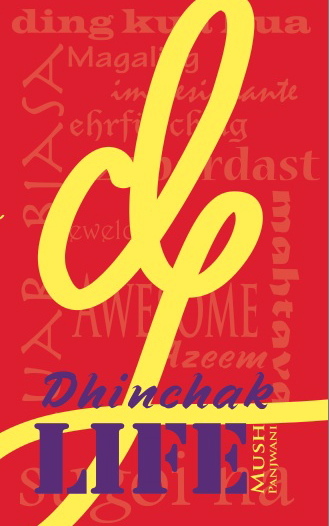 Dhinchak Life also had a successful launch at Dymocks, one of Hong Kong’s leading book stores, in November 2012. Read the story here. A poor kid who had to start working at the age of 15, right after finishing secondary education from a charity school in Karachi. He started without any education, money, or a proper house to live in. All he had were dreams, and love for a girl who was only 13 – both of which gave him hope for life and an immense power to change it. By the age of 25, Mush had educated himself, was heading the most successful direct sales organization in the country, had married the woman of his dreams, had two of his four kids, and was living a life of comfort. Fast-forward to today (2012)… Mush is 47 years; has established himself as an authority on direct sales in Asia; has positively influenced the lives of thousands of people in the industry as a sales trainer and motivational speaker; is heading the sales and marketing of an international publishing company based in Hong Kong; has traveled the world; has celebrated a silver jubilee anniversary with the love of his life; has helped raise four wonderful kids; is living an extremely happy, productive and fulfilled life; and has just got his first book published! The wonderful journey of these 32 years is not what this book is about. In short, this book is about living life fully and well. Each piece in the book is independent and complete on its own, so you can read it from the beginning, end or anywhere in the middle. And when you have finished reading it, please pass it along to a friend – that is, if you are reading a hard copy. Every language has a word that represents positive thoughts and emotions about a person, place or a situation. People who choose to see the good in everything love these words. People who find faults with most things rarely use these words. In English, the words are ‘wow’, ‘fantastic’ and ‘awesome’. In Chinese, it’s ‘ding kua kua’ (dynamite). In Arabic, it’s ‘azeem’ (great). In Indonesian, it’s ‘luar biasa’ (extra-ordinary). In Urdu, it’s ‘zabardast’. And in Hindi slang, it’s ‘dhinchak’. These are not celebrities or authors, but ordinary people who have been extra-ordinarily successful in their lives. And they have known Mush for a long time. Suraj Sajnani, one of my newest friends who volunteered to do a professional job of editing, formatting, and layout of the book, with an impressive attention to detail. And the hundreds of wonderful people who have touched my life positively through their wisdom, inspiration and kindness… Rick, Shad, Jamal, Zishan, Lax, Indra, Anu, Robert, Prabah, Irene, Lew, Chito, Jiffry, Rommanee, Thomas… just to name a few. I look forward to your comments. Also check out my other ebook which is free to download. Thanks, Suraj! Your help with the project made a huge difference… and I owe you for that. I am so proud to be associated with you. Can’t wait to get the book and read it. I’ll look forward to hearing your comments after reading the book. Wow Mush! Finally your book is here. I have been waiting. Congratulations and Well done. Well, I am looking forward to reading something gr8. To be honest, so far somehow I have managed to stay away from the Inspirational books/CDs, like Toni Robinson and some Kayosaki. I know there’s nothing wrong with them and they helped many a great deal, but they never really uplifted me. After reading and lestening to them, I remained at the same – uplifted level. Although I am always a happy go lucky guy, have positive attitude, fun loving and crazy about fitness (with 2-3 times of Tennis, exercise almost daily and healthy food), I know for a fact Mush’s book will further uplift me to a Dhinchak level. Congratulations!! You just proved to the world,what you preach:) proud to be associated with you. Waiting to get my hands on the book. This is a simply superb Mush…Dhinchak Life! is going to be my gift to share on Diwali with all my family and friends 🙂 …let me know if there is a simpler way to process bulk orders. I am so glad that I was able to make a small contribution to this happiness-spreading project !! Thanks, Charu! I’ll email you with details on bulk orders. Your contribution to the project wasn’t small by any means – I owe you big time for your help! congratulations!! 😀 this is so amazing mush! best of luck for the future! and i want a signed copy from you! can’t wait to read this book! Congrats Mush, that’s truely outstanding for you to publish your first book.It must have felt good and I am sure there will be many more to come because the first book to publish is always the toughtest. Keep up the great positive spirit you always carry with you and all the best to your furture undertakings.I will get your book for sure. Congrats Mushtaq Uncle, Very interesting Intro ,Inspired me nice and true. Hey Abuzar, I hope you get a copy and get even more inspired! Wow Mush you have done it ! Congrats! My comments are based on the “About Mush ” only . Excellent attempt . I know and also a witness to your struggle , for achieving this position. Mush to become some successful person merely hard work. Struggle , and dedication alone isn’t sufficient ,but luck and fortune are indeed instrumental . My experience says. Well done you have become the first English author of our community. Iqbal bhai, thank you for your comments! I totally agree with you, and acknowledge that I have been blessed with good luck! Hi Mush, have been hearing so much about you from Ketaki that I almost feel that I know you. Was waiting to get my hands on your book and once it arrived, it was difficult to put it down. It gave me an insight to the kind of person you are, genuine, simple and down to earth. It was a very interesting compilation of the simple truths of life. It has a good flow and the best part is like you rightly said, one can open any page and it is sure to have an impact on some aspect of your life. Look forward to meeting you soon and wishing you all the best in your future endeavours. Hi Shankar, thank you for your kind words. I too look forward to meeting you soon. Cheers! 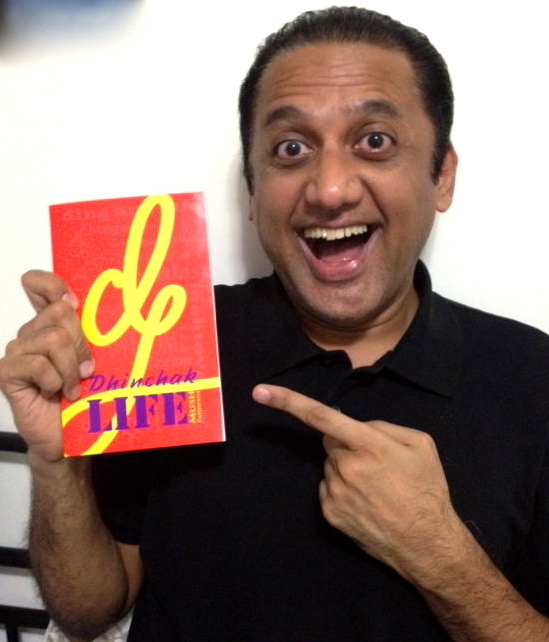 I usually read a book when I am feeling fresh and relaxed so I can concentrate more; however with ‘Dhinchak Life’ I found myself wanting to read it when I am not feeling so good and Voila! I am instantly re-charged, re-energized and re-freshed with positives thoughts in my mind. Thank you for giving us such great inspiration. Wow! You just made my day totally dhinchak! Thanks Snehal, for such wonderful feedback! Oh brother Mush congratulations 4 ur book which i hpoe to read it soon,yes ur life deserves to be written 4 many poeple to learn about a real person sees life as Dinchak,he was always looking to the bright side leaving the dark one for the looser.Congratulations again and i hope to meet u n ur wonderful family one day. Hi Samia, many thanks for your kind and positive comments. Best wishes! KASH Events and Entertainment is proud to be working on the book launch of Dhinchak Life and to have cross paths with you and your beautiful family! Very well said! It’s an easy read and extremely engaging book!! Keep the great work coming, proud to be additions in this project. Very excited to Officially Launch and Live Dhinchak Life! Hi Muskaan, thanks again for posting the feedback here. Made my day! I started reading bits and pieces of this book 2 weeks back, and I absolutely loved what I read. I finally decided to wake up one morning and read the book from start to finish, and I did within a few hours. It is an AMAZING book!!! It is a bible I will live by. So simple yet so profound!! Happy new day- if we can all live by this, we all are bound to live life to the fullest! So proud to be associated with the launch of my bible 🙂 Thank you for giving us this book! Hi Karishma, thank you for your positive comments. I loved how you highlighted a few topics! Most of us overlook the simple things that could make a huge impact in life.This masterpiece easily helps the reader to remember those simple things. Your perspective of life, which I am trying very hard to follow is truly amazing. My wife has read this masterpiece over 5 times.i am almost through it. Thanks for switching on the lights of simple living in me. Cheers. Dear Hussein, many thanks for your comments. I’ve seen your personal development journey over the year, and it’s impressive what you have achieved. Best wishes! Congratulations on publishing this great book. It’s a very enjoyable read with lots of great tips on how to live a ‘dhincak life’! Thanks, Stephen! That means a lot coming from a highly successful and happy person like you. Best wishes! Thanks again for sharing valuable advice and insights in your book. An idol in my life. Hats off to you bro! I have always seen a charming look and a smiling face, No matter how hard times or bad phase you’ve have been through. Congrats MUSH on your first book. I secured a hardcopy through Amazon, completed reading last month. Some of the key points/aspects I liked in the book..
•	Page 13 – Bullet point no. 1, 1st sentence is very much self-motivating. •	Page 15 – Point No. 1 tip on avoiding negative people that really works. •	Page 20- “Unwritten code of conduct” for happy marriage.. Again, an excellent tip for improving quality of personal life. •	Page 27 – Listening with “EYES”. This is AWESOME, I often do this and the story helped me correcting this to a great extend! •	Page 38. Let go off the past concept – really helps to move forward..
•	Page 98 & 99 -MY MOST FAVOURITE in the book is the Life lesson from “MOTHER & BABY GIRAFFE”. At times or often we have to bring the mother giraffe from within. A story that I will remember for the rest of my life. Thanks once again for this wonderful reading experience, looking forward to more from you & wishing you all the very best. Congratulations on this little masterpiece, I truly enjoyed it! It’s precise and short and contains so much practical wisdom and a spirit of happiness and cheerfulness for life, quite remarkable how you condensed it so tightly and such a charming way. I have already implemented tools and tricks from the mush lifestyle! You really make a difference! Thank you Mush! Thanks Mush for the amazing book! It is a ‘treasure’ and I believe this is a gift whether you want to take it or not. I am sure readers can benefit from this book, and apply some techniques to their daily life. Being truly happy seems like a challenge in such a fast pace city in HK, so it’s important for people to look for positive energy, we all have to look for it and this book can certainly help! Hi Cherie, thank you so much for your positive comments. Best wishes! Great great stuff! Highly recommended this author ! I trust you can learn to be more happy, more efficient, more determined after reading this book! What can I say when I can learn something new everyday? Try to read a chapter every night before you go to bed, it can remind you who do you choose to be tomorrow. I love this book and I will pass it to my friends, really inspirational!! Thanks Mush! If you want to give a positive twist to your life in just a matter of hours, then read this book and you won’t be disappointed. I’ve read myself quite a number of books on self-improvement, happiness and success, but they are usually heavy and not so easy to digest. This is a compact one, full of take-aways and easy to put in practice. It’s not asking you the achieve some mantra or employing complex meditation techniques, rather to take small and reasonable steps that can make a difference to your life. I found this book very helpful even in areas of my life that are not directly related to my job, business and health. And this, i guess is because of the fact that it deals with the core or essence of human life and the ideas in this book can be applied to any facet of human existence. To my surprise, it significantly improved my relationships and my approach to religion. Yes! i have developed a kind of conviction ; the author practices what he is preaching. Thanks Nazia, for the kind words!